Brandon Yule, a volunteer firefighter in Worland, Wyo., was called to the scene of the Big Horn River flood at 7 a.m. An ice jam under a bridge had apparently caused the river to rise overnight, and water was starting to flood nearby homes. But by 9 a.m., Yule and the team still couldn’t get a view of what was causing the water to continue to rise. “I thought it would be an opportune time to request from the incident commander that I retrieve my Quadcopter” – his personal drone – “to send it up and see if we could see what the extent of the event was,” he said. Yule returned with his drone, took a few minutes to prepare it for launch, and sent it out over the Big Horn River to survey the scene of the flood. Thus was a hobby drone effectively drafted into an official emergency response team in Washakie County for the first time ever. And it pulled its weight: The drone got a view of the flooding in a quicker, cheaper and more flexible manner than resources would typically allow. Flying above the swelling river, the lightweight drone captured high-definition photo and video with its GoPro camera, showing officials what they couldn’t see from the ground – the extent of the flooding, the size and location of more ice jams clogging the river in other places – and helping them plan their next moves, like whether to evacuate residential areas, where to lay sandbags and which towns to inform downstream. And all this, without resorting to the expensive, complex and inherently risky measure of a helicopter flight, and without wasting time. The Star-Tribune reports officials from Wyoming’s National Guard and Office of Homeland Security who were on hand for the response got an impromptu demonstration of the potential for this type of drone in disaster management. “They were all amazed at the technology and how well it worked to see what we couldn't from the ground,” Yule said. The extent of that technology: A Quadcopter drone equipped with a GoPro camera, and a live video feed to a 7" screen hooked to Yule’s remote control on the ground – all for about $1,600. The day after flooding began, Yule met with a local member of the Army Corps of Engineers to fly the drone over more of the affected areas north of Worland, like Greybull and Manderson, tracking ice jams as they moved downstream along the Big Horn River. He too was impressed at how the close-range, real-time view from the drone gave them a better look at specific areas than would have been possible from a full-sized aircraft. Yule uploaded some of this early aerial footage to YouTube so officials in Cheyenne could use it to plan their response, like how many National Guardsmen and what type of vehicles to send to Washakie and Big Horn Counties. He was even able to hover his drone above the flooding and pick out a number of stranded cows and calves that may not have been seen from the ground as the water rose. While the news from Wyoming is overwhelmingly positive, there are still plenty of public concerns surrounding drones. For many people, the word “drone” conjures images of unmanned U.S. military bombs targeting civilians in faraway war zones – not devices like Yule’s. The Federal Aviation Authority is still working to create federal laws to regulate drones in public airspace, and meanwhile several cities around the U.S., apprehensive about protecting citizens’ privacy, have banned the use of drones by law enforcement until there are thorough rules in place to oversee their use. Those concerns shouldn’t be dismissed, but the good uses that people have found for drones in recent years should be considered, too. Conservationists, for example, are using camera-equipped drones to help map sensitive habitats and protect endangered species around the world. In poor countries that lack the infrastructure or funding to fly manned aircraft over difficult terrain, drones are allowing conservationists and natural resource managers to understand ecosystems like never before – like where orangutans nest in forest treetops and where oil palm plantations are encroaching on fragile forests. There is even a new Wildlife Conservation UAV (Unmanned Aerial Vehicle) Challenge, with 120 teams competing to build the most useful anti-poaching drone. Brandon Yule prepares to launch his personal drone during the flood response in Worland, Wyo. earlier this month. Photo courtesy of Brandon Yule. And now the Worland flooding has given us an example of the usefulness of drones in emergency response, a realm of UAV use still largely unexplored. And it opens the door to more possibilities: What about fire? What about avalanches? Ethan Greene, director of the Colorado Avalanche Information Center, said that while the center hasn’t used drones yet, they have considered it. 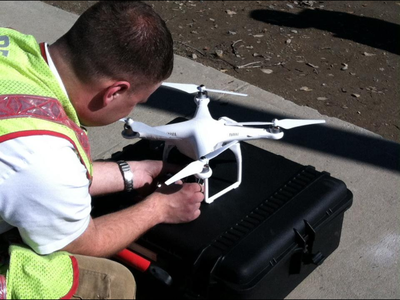 “What we would want to use drones for is verifying avalanche activity,” he said. “The potential for using them for monitoring and observation is within the grasp of programs like ours.” For example, he could send a small drone equipped with a camera to a known avalanche site to look for evidence of possible human injury – like ski tracks or a debris pile. He cited a recent avalanche accident in a remote mountain area of Montezuma County where a drone may have been a quicker, cheaper and less risky option than a helicopter to do that type of verification. But that’s about the limit of drone potential for now, he said, because a drone big and heavy enough to carry explosives – say, 35 pounds of explosives, the kind dropped onto an unstable area to induce an avalanche – would be too expensive and too controversial at this point. As for Yule’s drone, it isn’t the type that should worry the neighbors. For one thing, it’s too loud to quietly spy on someone: “This thing sounds like a ticked-off hornet’s nest!” he said. Plus its camera is equipped with a wide-angle lens designed for capturing breadth, not close-up details. Perhaps the more examples there are of drones used for the public good, the more likely legislators are to create policies that allow for beneficial uses while addressing public fears of prying, spying flying machines. Christi is an editorial intern at High Country News. She tweets @christi_mada.